As befits the best of Saturdays today started with reading at Caffe Nero for 90 minutes, followed by a walk along St Annes prom and back home, where I collected Debbie and we set off for Cleveleys. I’ve been looking forward to eating brunch at the Cafe Cove for a month now, but as a result of a death in the family and the terrible storms it’s been closed. Fortunately when I passed yesterday I happened to see the owners popping in the back door with bags full of food and milk, so I was pretty confident it would be open, and I was right. We parked up at the Blackpool end of the prom and walked to the far end, and I breathed a sigh of relief as I saw the Cafe shutters up and the doors open. We had a wonderful meal, watching the fun on the beach and the sun burning off the mist that was initially shrouding the Lake District. By the time we finished eating the sun was in full force so we decided to walk to Freeport via Fleetwood, which was a first for Debbie. It was a great walk, but the highlight was finding Rossall Point lookout open and we got the guided tour and spent a good 20 minutes on the top floor chatting to the guide about the joys of soaking up the view, bird and storm watching. 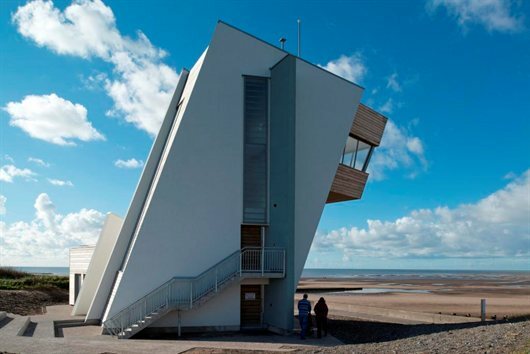 There’s lots of information at the web site above, it won an award and they are on twitter @rossallpoint. Previously I’d assumed that the whole building was a coast guard station, but there are three floors for community use. I can’t wait to go back there again. There are some interesting volunteer opportunities there, but while investigating I also discovered an event next week, the Fylde Community Showcase which is on Tuesday 25th at the Lowther Pavillion Lytham from 11-00 – 15-00 there will be over 80 different voluntary organisations there, I will be there too! 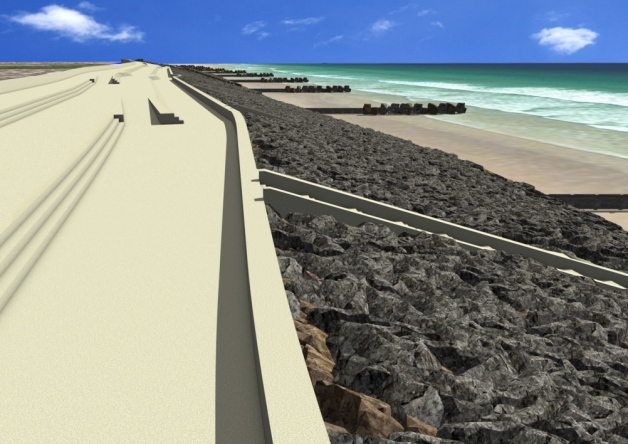 The other existing thing we discovered was that the sea defences between Fleetwood Hospital and golf course are being radically improved, which will further enhance what is already a beautiful stretch of coastline, something to look forward too, once it’s finished. We saw the plans and they looked great. When we got to Fleetwood we took the public footpath that follows the estuary bank all the way to Freeport, avoiding all of the main road, which was a first for both of us. The estuary is a bit muddy, but it reminded us of the banks of the Humber so we felt right at home. We did a quick circuit of the walking shops before catching the tram back to Cleveleys. This was only Debbie’s second and my third Tram ride so we enjoyed it more than most. It was pretty windy today and Debbie suffered from cold ears, so we popped into Halfords and got a cyclists headband, which seems to have done the trick. I was fine in my best walking hat. We popped into Morrison’s to buy cake, an essential treat after 3 hours of walking before settling in for a games and TV night.